The Global Volcanism Program has no activity reports for Kunlun Volcanic Group. The Global Volcanism Program has no Weekly Reports available for Kunlun Volcanic Group. The Global Volcanism Program has no Bulletin Reports available for Kunlun Volcanic Group. The Kunlun volcano group in NW Tibet contains 70 well-preserved pyroclastic cones. The trachyandesitic Ashikule volcano group at the western end of the Kunlun Mountains is the site of at least 10 volcanoes of Pliocene-to-Holocene age, including Ashi Shan volcano, the youngest in China. This and several other young cones lie in the area around Ashi (Aqqikkol) and Wuluke (Ulugkol) lakes. China's most recent volcanic eruption was observed by a road-building crew on 27 May 1951, at Ashi Shan (also known as Ka-er-daxi or Vulkan) pyroclastic cone. The eruption began with a loud detonation and ejected large blocks, emitting "smoke" for a number of days. An unconfirmed eruption was reported in the 19th century. Liu J, 1986. (pers. comm.). Liu J, Maimaiti Y, 1989. Distribution and ages of Ashikule volcanoes on the West Kunlun Mountains, West China. Bull Glacier Res, 7: 187-190. Wei H, Sparks R S J, Liu R, Fan Q, Wang Y, Hong H, Zhang H, Chen H, Jiang C, Dong J, Zheng Y, Pan Y, 2003. Three active volcanoes in China and their hazards. J Asian Earth Sci, 21: 515-526. There is no Deformation History data available for Kunlun Volcanic Group. There is no Emissions History data available for Kunlun Volcanic Group. 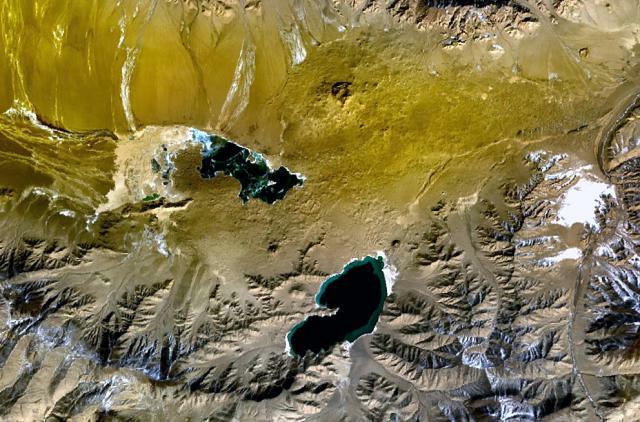 The Kunlun volcano group in NW Tibet contains 70 well-preserved pyroclastic cones, many of which are located near Ashi (left-center) and Wuluke (bottom-center) lakes. The northern cone (top right-center) is the largest in the volcanic field and has many satellitic craters on its SE side. China's most recent volcanic eruption was observed by a road-building crew on May 27, 1951, at Ashi Shan, the cone located between the two lakes in this NASA Landsat image (with north to the top). There are no samples for Kunlun Volcanic Group in the Smithsonian's NMNH Department of Mineral Sciences Rock and Ore collection. Large Eruptions of Kunlun Volcanic Group Information about large Quaternary eruptions (VEI >= 4) is cataloged in the Large Magnitude Explosive Volcanic Eruptions (LaMEVE) database of the Volcano Global Risk Identification and Analysis Project (VOGRIPA).